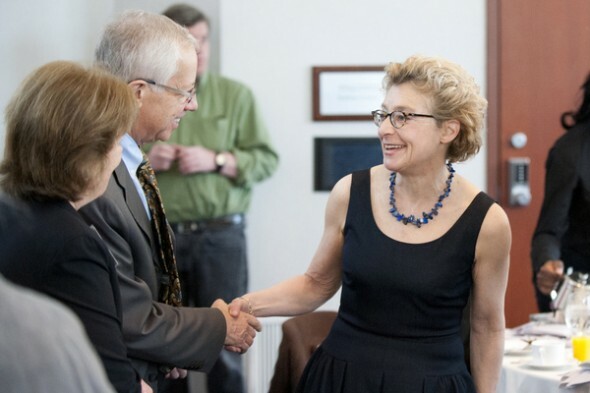 At the Northeastern Holocaust Commemoration, Bernard A. Stotsky Professor Laurel Leff (right) explained that American universities had one of the few lifelines to extend to refugees fleeing Europe to escape Nazi persecutions, but they didn’t do enough. Photos by Brooks Canaday. A pro-Israel lecturer from Montreal found the words “Heil Israel” scrawled on his office door. JBuzz News July 18, 2012: Michael Brenner: Is Brit Ban The Gravest Threat to European Jews Since 1945? Is this the gravest threat to European Jews since 1945? When Catherine Chatterley was growing up in Winnipeg, the first serious book she read was The Diary of Anne Frank, the harrowing story of a young Jewish girl forced to hide for nearly two years in an attic in Nazi-occupied Amsterdam. For Chatterley, who was raised in a devout Lutheran home, the famous book sparked a lifelong fascination with the Jewish people, the Holocaust and anti-Semitism. That fascination has prompted Chatterley, an adjunct history professor at the University of Manitoba, to develop the first academic institute in Canada to focus on the study of anti-Semitism, which she says is a persistent — and in some parts of the world flourishing — problem facing Jews today. “There is a void in academia, our universities and our human rights discourse” when it comes to the study of anti-Semitism, she said in a telephone interview from Winnipeg, where the Canadian Institute for the Study of Anti-Semitism (CISA) is based. CISA, which is barely two years old, is one of only six such institutes in the world. Its mandate is to promote research, education and awareness of anti-Semitism. Ultimately, her goal is to have the independent, non-profit institute fund and offer university-accredited courses leading to an undergraduate degree in the study of anti-Semitism. In addition, she plans to develop an online publication for young people and publish an academic journal on current and historical anti-Semitism. The story of world Jewry covering the past six decades must be defined as one of achievement and recognition. American Jews have achieved extraordinary success and influence, and Israel, despite threats to its existence, has flourished as a democracy, and absorbed and resettled millions of Jews. Yet, as the world marks the 80th anniversary of the rise of Nazism, the status of Jews in the world seems to be seriously eroding. During this period international politics was influenced by the powerful motif of memory. The images of past atrocities that tarnished the 20th century created a baseline for moral action. Over time, though, the power and integrity of this historical record has seemingly faded. Now, 822 years after some 150 Jews were massacred in York’s Clifford Tower, a commemoration hopes to dispel the myth of the Cherem of York – the prohibition of resettling the city since the mass-murder. Eight hundred and twenty-two years after some 150 Jews were massacred in York’s Clifford Tower, the most comprehensive commemoration of the worst anti-Semitic attack in the British Isles will take place today (Friday) in England’s ancient Capital of the North. The event will be the culmination of an academic project chronicling the York Massacre using advanced technology and dispel, the organizers hope, one of the most pervasive myths of Anglo Jewry, that of the Cherem of York – the prohibition of resettling the city following the mass-murder of its Jews. Clifford’s Tower, also known as York Castle, is the most distinct landmark dominating the city’s skyline and has served for centuries as York’s symbol. First built as a Norman fort in 1068, it has been rebuilt many times and served as a military keep, prison, law court and today serves as a museum, but the only mention of the most bloody episode in its nine and a half centuries of history is a plaque at the foot of the tower unveiled by the Chief Rabbi of Britain and the Lord Mayor of York in 1978. Professor Helen Weinstein at the plaque commemorating the massacre. The York Massacre was just one of a wave of anti-Jewish riots that began eight months earlier at the coronation banquet of King Richard I, when a group of Jews who arrived to pay their respects were forbidden entry. Despite being under the King’s protection, the Jews who had prospered for over a century as money-lenders, became the target for attacks by local noblemen who were anxious to wipe out their large debts. Murderous attacks began in London and spread to other Jewish settlements throughout England. Richard, who had initially humiliated the Jews at his coronation, was concerned that the attacks were a challenge to his own rule and had a number of the perpetrators executed, while issuing orders to protect the Jews. This, however, put him on a collision course with the church, which he was eager to appease, and in early 1190 the new king embarked on a crusade to the Holy Land while not taking measures to enforce his order. The riots reached the northern towns of Norwich, Lincoln and Stamford in March; homes of Jews in York were attacked, forcing the 150 Jews of the town to take refuge in the royal castle. But as there was no force defending the tower, and the local knights and clergy were leading the attack, the Jews preferred to kill themselves rather than accept forced baptism. Those who did not commit suicide were killed when the castle was set on fire. The rioters next burned all the records of the Jews financial affairs, thereby absolving them of their debts which would have been payable to the King following the death of the Jews. The King’s representatives held an inquest and fined the city, but none of the murderers were ever brought to trial, many of them later joining Richard on his crusade. No memory was left in the city of the killings, but archaeological digs have revealed burnt remnants of the original structure beneath the tower. Purim serves as an appropriate moment to recall a man known for a time as “America’s Haman.” That Gen. Ulysses S. Grant’s story ended very differently than the story of Haman in the Book of Esther reminds us how America itself is different, and how often it has surprised Jews for the better. On Dec. 17, 1862, as the Civil War entered its second winter, Gen. Ulysses S. Grant issued the most Haman-like order in American history: “The Jews, as a class violating every regulation of trade established by the Treasury Department and also department orders, are hereby expelled from the department within twenty-four hours from the receipt of this order.” Known as General Orders No. 11, the document blamed “Jews, as a class” for the widespread smuggling and cotton speculation that affected the area under Grant’s command. It required them to leave a vast war zone stretching from northern Mississippi to Cairo, Ill., and from the Mississippi River to the Tennessee River. Less than 72 hours after the order was issued, Grant’s forces at Holly Springs, Miss., were raided, knocking out rail and telegraph lines and disrupting lines of communication for weeks. As a result, news of General Orders No. 11 spread slowly, and did not reach company commanders and army headquarters in Washington in a timely fashion. Many Jews who might otherwise have been banished were spared. A copy of General Orders No. 11 finally reached Paducah, Ky. — a city occupied by Grant’s forces — 11 days after it was issued. Cesar Kaskel, a staunch union supporter, as well as all the other known Jews in the city, were handed papers ordering them “to leave the city of Paducah, Kentucky, within twenty-four hours.” As they prepared to abandon their homes, Kaskel and several other Jews dashed off a telegram to President Abraham Lincoln describing their plight. Lincoln, in all likelihood, never saw that telegram. He was busy preparing to issue the Emancipation Proclamation. The irony of his freeing the slaves while Grant was expelling the Jews was not lost on contemporaries. Some Jewish leaders feared that Jews would replace blacks as the nation’s stigmatized minority. Not all Civil War-era Jews were speculators, peddlers or smugglers, and not all Civil War-era speculators, peddlers and smugglers were Jews. But Americans living through the rebellion — and many crises before and since — often cast blame on the tiny minority that 19th-century Northerners and Southerners often referred to as “the Israelites.” Shocking as it seems, one of the most notorious offenders was the greatest Union hero of the war: Ulysses S. Grant. That Grant harbored anti-Semitic inclinations should come as no surprise. He was educated at West Point and spent years in the Army, both bastions of period intolerance. In 1862, he assumed a particularly chaotic military command, including border states technically loyal to the Union but filled with slave-owners and Confederate sympathizers. Into this combustible mix swarmed speculators eager to turn chaos into cash — among them, certainly, Jewish ones. Grant and his chief lieutenant, William T. Sherman, groused about the Jews’ presence repeatedly but initially kept their concerns to themselves. What apparently sent Grant over the edge was the arrival of another camp follower — his greedy father, accompanied by three Jewish business partners, all eager to use the general to secure profitable cotton-trading permits. Grant blamed the Jews. Still, no historian has been able to fully understand — much less justify — why, on Dec. 17, 1862, Grant issued his notorious General Orders No. 11 deporting Jewish citizens. “The Jews, as a class violating every regulation of trade,” went the chilling text, “. . . are hereby expelled from [his command in the West] within twenty-four hours.” Those returning would be “held in confinement until an opportunity occurs of sending them out as prisoners.” Just two weeks before Abraham Lincoln was scheduled to extend freedom to one minority group with the Emancipation Proclamation, his most promising general thus initiated a virtual pogrom against another. In the end, as the gifted and resourceful historian Jonathan D. Sarna points out in this compelling page-turner, General Orders No. 11 uprooted fewer than 100 Jews. But for a few weeks, he suggests, it terrorized and infuriated the Union’s entire Jewish population. It also inspired one of the community’s first effective lobbying campaigns. Jewish newspapers compared Grant to Haman, the infamous vizier of Persia in the Book of Esther. A delegation of Jewish leaders traveled to the White House to protest directly to the president, who quickly but quietly had the order revoked, eager to right a wrong but reluctant to humiliate a valuable military commander. As Lincoln carefully put it, “I do not like to hear a class or nationality condemned on account of a few sinners.” He never mentioned the episode publicly. Grant tried not to as well, understandably omitting it from his otherwise exhaustive memoirs. In 1868, however, he did issue a letter confessing: “I do not pretend to sustain the Order. . . . [It] was issued and sent without any reflection and without thinking of the Jews as a sect or race. . . . I have no prejudice against sect or race.” But Sarna notes that this weak and “self-serving” statement — neither an admission nor an apology — “did not actually bear close scrutiny.” Besides, it was motivated as much by politics as regret. At the time, Grant was running for president, and Jews were threatening to block-vote against the Republican. Although no statistical evidence survives, most Jews probably did vote Democratic in 1868. The general won anyway. And to his credit, he continued to evolve. The Jewish tradition encourages atonement and makes forgiveness mandatory. Grant made amends; the Jews forgave. As president, Grant appointed Jews to official posts, welcomed Jewish delegations, supported Jewish relief efforts in Europe and once attended a worship service at a Washington synagogue, the first president to do so. When he died, Jews mourned him as a hero. Sarna’s account shines brightest around the edges of the story, offering valuable new insights into ethnic politics, press power and the onetime ability of leaders to flip-flop with grace. In a particularly stunning, if disturbing, argument, he suggests that many Northern Jews brought suspicion on themselves by questioning emancipation, fearful that freed blacks, abetted by anti-Semitic abolitionists, would compete with immigrant Jews for economic opportunity. 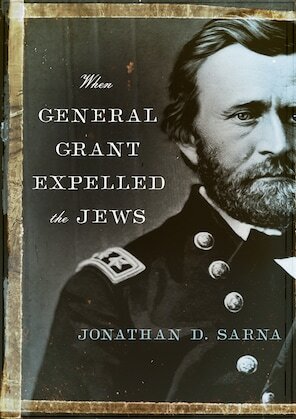 Sarna shows how ineffective communications within Grant’s command further ignited unfounded calumnies against Jews. And he posits that the general’s military subordinates might have urged their overworked chief to ban Jewish speculators in order to leave the field open for their own graft. Some quibbles: The illustration of “Grant, about 1860” is a photo of a beef contractor mistaken for the general; and Sarna’s occasional embrace of au courant phrases (“He was a one-man Anti-Defamation League,” “speak truth to power”) proves jarring. What is still the best analysis ever offered about Grant’s greatest mistake came from his widow. In her own unsparing memoirs, Julia Dent Grant called General Orders No. 11 “obnoxious,” admitting that her husband “had no right to make an order against any special sect.” Sarna’s excellent study offers no excuses either and comes closer than ever to an explanation. It later emerged that Professor Cameron Johnston, who is Jewish, was using the statement as an example of an invalid and dangerous opinion that must be reasonably qualified. It appears that Grunfeld left the 450-seat lecture before Cameron qualified the opinion. Grunfeld was widely rebuked, including by Maclean’s own 22-year-old Jewish columnist, Emma Teitel. But she didn’t go away quietly. She’s now back in a YouTube video called The Truth Behind the Sarah Grunfeld story. At least, we assume it’s her; the face in the video appears in silhouette. “I was ridiculed, I was demonized,” says the shadowy figure. “I was called an moron, a dimwit, an idiot…” The figure then explains that she was paying full attention (FULL ATTENTION!) and sitting in the front row of class. “I know exactly what I heard,” she says. The shadowy figure admits that the comment happened in the “first five minutes of [Cameron’s] talk about how opinions can be dangerous.” She says she waited for the professor to provide some kind of qualifier, but he did not. Barnard College was cleared of charges that a professor discriminated against an Orthodox Jewish student by steering her away from a class. Professor Joseph Massad, a critic of Israel who also has been accused of being anti-Semitic. Barnard is affiliated with Columbia. The Office of Civil Rights said it decided to halt the probe due to conflicting accounts of what occurred during the meeting between McDermott and the student, and because no other Jewish students have come forward to say that they also were steered away from the course. “Because of the conflicting version of events and no other evidence to support the complainant’s allegation, OCR determined that there was insufficient evidence to substantiate the complainant’s allegation that the Chair discriminated against the Student, on the basis of her national origin, by discouraging her from enrolling in the Course,” the letter said. The complaint was filed by Kenneth Marcus, director of the Initiative on Anti-Semitism at the Institute for Jewish and Community Research. Marcus told the Columbia Spectator student newspaper that he is looking into appealing the case. Marcus is a former head of the Office of Civil Rights. Kent State University history professor Julio Pino, right, shouted “Death to Israel” at a presentation by Israeli consulate official Ismael Khaldi, seen in this flyer for the event. A Kent State University professor allegedly with former ties to a jihadist website shouted “Death to Israel” at a public lecture delivered on the Ohio campus by a former Israeli diplomat. The outburst came during a presentation this week by Ismael Khaldi, a former deputy counsel general at the Israeli consulate in San Francisco. During the question and answer period, KSU history professor Julio Pino launched a series of provocative questions at Khaldi. At some point, the professor shouted “Death to Israel” and then stormed out of the building. The event was first reported by the KSU student news site KentWired. At the same time, he defended Pino’s free speech rights. “It may have been professor Pino’s right to do so, but it is my obligation, as the president of this university, to say that I find his words deplorable and his behavior deeply troubling,” his statement read. Pino, who is originally from Cuba and a convert to Islam, did not return calls for comment. A Kent State spokesman confirmed the professor was once investigated by federal authorities. The university said they were also aware of allegations that Pino wrote stories for a now-defunct jihadist website. And according to the Akron Beacon Journal , the professor eulogized an 18-year-old Palestinian suicide bomber in the Daily Kent Stater, the student-run newspaper. The U.S. Department of Education is investigating Columbia University for allegedly discriminating against a Jewish student. The probe by the department’s Office for Civil Rights concerns an Orthodox student at the Columbia-affiliated Barnard College who was “steered” by an academic adviser away from a course taught by Professor Joseph Massad because she would be made uncomfortable, according to the complaintant, Kenneth Marcus, the director of the Initiative on Anti-Semitism at the Institute for Jewish Civil Rights. Marcus served as the head of the Office for Civil Rights in 2003-04. Massad, a sharp critic of Israel, was cleared of accusations of anti-Semitism by a Columbia committee some years ago. “Steering” is a legal term typically used in housing discrimination cases, such as when a black family might be steered away from a white neighborhood. Columbia President Lee Bollinger said in a statement that the university has strong policies against discrimination and treats such allegations “very seriously.” He also noted that the complaint appears to relate to academic advising and it was unfair to cite Massad because he played no part in the matter. In 2004, Marcus instructed the Office for Civil Rights to be vigilant about campus anti-Semitism. It’s possible Morningside Heights has found its annual autumn incident. A U.S. Department of Education committee is investigating whether a Columbia University department head “steered” a Jewish student away from taking a class on the Mideast taught by Professor Joseph Massad due to the perception that she would be “uncomfortable” because of the professor’s pro-Palestinian tilt, according to the Institute for Jewish & Community Research’s Kenneth L. Marcus, the complainant in the case. According to Marcus, Judith Jacobson, an epidemiology professor at Columbia’s Mailman School of Public Health who is also active in campus politics, informed him of the alleged incident. He also said that Education’s Office for Civil Rights, which he headed for a time during the Bush administration, informed him it had granted its request to launch a probe. “The University has strong policies against discrimination and we treat allegations of discrimination of any kind very seriously,” Columbia President Lee C. Bollinger said through a press officer. “It is important to note that the individual complaint appears to relate to academic advising at Barnard College and in no way involves Professor Joseph Massad. Based on these facts, therefore, it is extremely unfair for Professor Massad to be cited in a matter in which he played no part whatsoever.” Added Barnard Vice President for Communications Joanne Kwong: “We do not tolerate discrimination by any member of the College community, so we are carefully exploring and reviewing the claims made about this alleged incident. As this is a pending investigation, it would be inappropriate and premature to comment any further at this time.” OCR has not replied to a request for comment. Massad was one of a few members of Columbia’s Middle Eastern Studies faculty who came under fire in 2005 in a film produced by the David Project, a pro-Israel advocacy group. The documentary, Columbia Unbecoming, featured several students alleging that Massad and others had cultivated classrooms hostile to pro-Israel voices. Maybe most memorably, Massad was accused of asking one student, who had identified himself as a former Israeli soldier, how many Palestinians he had killed. Massad disputes the story. (He has not replied to a request for comment.) A subsequent investigation by Columbia did not lead to any of the professors leaving, prompting critics to call it a whitewash. Technically, “Barnard’s Middle East studies department chair” (Barnard is an all-women college at Columbia) is accused of encouraging the student, who was dressed as an Orthodox Jewish woman would be, not to take a particular class in January 2011, in violation of federal civil rights law. (In the spring 2011 semester, Massad’s class was a seminar on “Contemporary Culture in the Arab World”; this fall, he is teaching an open lecture on “Palestinian-Israeli Politics and Society.”) But Marcus’ actual beef is not with the act of steering by the individual department head. It’s with Columbia’s alleged failure to address the perception that Massad’s classes might make Jewish students unduly uncomfortable. In addition to working at the OCR, as assistant secretary of education for civil rights, Marcus was appointed by President George W. Bush to serve on the U.S. Commission on Civil Rights. That independent commission has a mandate to examine all charges of civil rights violations, although on its Website, the most prominently trumpeted specific issue is, “Ending Campus Anti-Semitism.” According to Marcus, he issued a guidance for the OCR to police campus anti-Semitism, which, he said, it not do since he left the office, in 2004, until last year, when, partly after the lobbying of several Jewish groups including the Anti-Defamation League, the Obama administration adopted an anti-bullying policy that reinstated that mandate. B’nai Brith Canada has called for “sensitivity training” for the faculty of Toronto’s York University in the wake of a complaint by a Jewish student over the remarks of a Jewish professor. BBC called on the university “to investigate further” the incident in which a student in a class taught by Professor Johnston “felt marginalized and targeted by the way subject matter relating to odious opinions was presented. “Clearly, a key message was miscommunicated, and sensitivity training needs to be instituted for faculty to ensure that such incidents do not happen again,” BBC said. On Sept. 12, Johnston began an introductory lecture to a first-year course with examples of extreme opinions and whether one should be entitled to them. “All Jews should be sterilized” is an example of such an extreme view, Johnston had said. Sarah Grunfeld, 22, a fourth-year student, stormed out of the class and reported Johnston to the Hasbara at York, an on-campus Israel advocacy group, which sent a news release to media and other Jewish community groups calling for the professor’s firing. The story went viral on social media. The 22-year-old York University student who mistakenly accused her professor of making anti-Semitic remarks issued an unapologetic response to the ridicule that has been widely levelled against her. Since the story was first published Wednesday in the Toronto Star it has rapidly spread on social networking sites, where readers have been unabashedly and openly scornful of Grunfeld. The incident has also been discussed in local newspaper comment pages and was picked up by U.S. gossip website Gawker. In fact, Johnston — who is Jewish — was explaining to the students that not all opinions are valid or acceptable, using the example of Jewish sterilization as a reprehensible opinion, with historical precedent. “I stand by my initial concern brought to the University’s attention immediately after the incident that when Professor Cameron Johnston made the abhorrent statement in his class that all Jews should be sterilized, he failed to qualify the statement clearly as an unacceptable opinion held by others. His delivery of this statement, made in a class of 450 impressionable students, was offensive to me and to others in the room. “I have since been grossly misquoted and ridiculed by the media, and attempts have been made to assign blame to me with the false claim that I simply ‘misheard’ or ‘half heard’ what was said. Meanwhile, the professor has not been called to account in any way for his ‘miscommunication’. “This is in spite of the fact that in a meeting with Martin Singer, Dean, (Faculty of Liberal Arts & Professional Studies at York) and Rhonda Lenton (Vice Provost Academic), I was assured that they believed Professor Johnston was ‘terribly regretful’, and that they expected and would encourage him to issue an unambiguous in-class apology. I have not heard even minimal expressions of regret by Professor Johnston, and a York university representative in subsequent communications with the media, has since contradicted the assurances I was given to that effect. Cameron Johnston, a social sciences and humanities professor at York University, is having to defend himself against allegations of anti-Semitism after a student apparently misunderstood comments he made in a lecture on Monday. A half-listening student, a hypersensitive campus and the speed at which gossip travels on the Internet conspired to create a very damaging game of broken telephone for one York University professor this week. Cameron Johnston, who has been teaching at York for more than 30 years, has been forced to respond to allegations that he made anti-Semitic remarks in a lecture on Monday afternoon after a student misunderstood his comments and began sending emails to Jewish groups and the media. Johnston was giving his introductory lecture to Social Sciences 1140: “Self, Culture and Society,” when he explained to the nearly 500 students that the course was going to focus on texts, not opinions, and despite what they may have heard elsewhere, everyone is not entitled to their opinion. “All Jews should be sterilized” would be an example of an unacceptable and dangerous opinion, Johnston told the students. He didn’t notice Sarah Grunfeld storm out. Grunfeld, a 22-year-old in her final year at York, understood Johnston’s example to be his personal opinion. She contacted Oriyah Barzilay, the president of Hasbara at York — an Israel advocacy group on campus — who then sent a press release to media and other Jewish community groups calling for Johnston to be fired. Blogs and Facebook groups picked it up, and in a few hours the allegations spread within the city’s Jewish community, albeit mostly online. Sensitivities around anti-Semitism are particularly heightened at York, which has a large Jewish population and a history of toxic relations between supporters and critics of Israel on campus. Johnston, who is Jewish, said his religion likely influenced his choice of words, why he used “this example of a completely reprehensible opinion” with historical precedent. During the Second World War, Nazi scientists experimented with mass sterilization on Jewish prisoners in concentration camps. The irony for Johnston is that he was trying to teach his students that ideas have consequences. Grunfeld said Tuesday she may have misunderstood the context and intent of Johnston’s remarks, but that fact is insignificant. Grunfeld also expressed skepticism that Johnston was in fact Jewish. Asked directly by a reporter whether she believes Johnston is lying, she was unclear. “This event is an appropriate reminder that great caution must be exercised before concluding a statement or action is anti-Semitic,” he said. The practice of depicting Jews as drinkers of blood has been common for centuries. The writer is a professor of religious studies and director of the program in Jewish studies at Drew University. This article was first published by Jewish Ideas Daily (www.jewishideasdaily.com), and is reprinted with permission. Eighteen ninety seven was a watershed year in Jewish history. The first Zionist Congress convened in a grand hotel in Basel, Switzerland. With much less pomp, the Yiddisher Arbeter Bund, the Jewish Labor Movement, was clandestinely founded in a Vilna basement (socialist movements being illegal under Tsarist rule). In New York, Der Forverts, the world’s largest-circulation and longest-running Yiddish newspaper, began publication. Meanwhile, in Odessa, the Hebrew-language Ha- Shahar, the first and most influential Zionist journal, was founded under the editorship of Ahad Ha’am. And now, thanks to Blood Will Tell, an engaging and insightful new study by Sara Libby Robinson, Jewish historians may consider adding a surprising entry to this list of 1897 events: the publication of Bram Stoker’s Dracula. While never explicitly identified as a Jew, the figure of Dracula – and vampires more generally – encompassed an array of anti-Semitic stereotypes: rootless, of East European origin, dark-complected, and lusting after the money/blood of others. Assessing a wide range of themes in which blood and vampirism were evoked in late-19thcentury European “scientific” thought (Social Darwinism and criminology in particular), Robinson argues that Stoker’s depiction of Dracula exploited widespread anxieties about the dangers posed by the flood of Yiddish-speaking immigrants to Great Britain. FOUR leading Jewish academics in Scotland have quit one of the largest UK lecturers’ unions over its stance on the definition of anti-Semitism. Canada is fertile ground for anti-Semitism, especially on university campuses, a parliamentary committee has concluded. After two years of hearings, the Canadian Parliamentary Coalition to Combat Anti-Semitism in a report released last week called on the federal government to do more to fight anti-Semitism in Canada, which it said is rising, due partly to increased hostility toward Israel. Over 10 days of hearings between November 2009 and February 2010, the coalition’s 22 members, consisting of lawmakers from all federal parties, heard from 74 witnesses, including federal and provincial politicians, diplomats, university administrators, academics, chiefs of police, journalists and other interested individuals. Among its dozens of recommendations, which are not binding on the government, the coalition said that police forces across Canada should be better trained to deal with anti-Semitism; Canada’s immigration department should take into account rising international anti-Semitism when designating source countries for refugees; and the Foreign Affairs Ministry should study the United Nations’ criticisms of Israel. One major concern of the coalition was Israeli Apartheid Week, an annual event on Canadian university campuses. “We had got several testimonies from students, particularly Jewish students, who were scared,” committee co-chair Mario Silvia, a former Toronto-area member of Parliament, told the Globe and Mail newspaper. Jeffrey Herf: Why Did Yale Close, Then Open, a Center for Studying Anti-Semitism? Developments at Yale University in recent weeks concerning the scholarly study of anti-Semitism have aroused broad attention. In early June, Yale’s Provost Peter Salovey accepted the recommendations of a faculty committee to close the Yale Initiative for the Interdisciplinary Study of Antisemitism (YIISA). On June 19, however, following an outcry over the news, Salovey announced that a new center, the Yale Program for the Study of Antisemitism (YPSA) would be established. The university’s Whitney Humanities has agreed to sponsor it, and Professor Maurice Samuels, whose scholarship focuses on the presentation of Jews in French literature, will convene this reconstituted center. For those of us who are familiar with YIISA and valued its engagement with scholarship about anti-Semitism not only in Europe but around the world, the decision to close YIISA was disturbing. We hope that the reconstituted program at Yale will incorporate the research concerns and ferment that YIISA fostered and place these at times unpopular efforts on a sound scholarly foundation befitting a great university. The stakes, for the study of anti-Semitism and the credibility of the academy more broadly, could not be higher.